Clarksdale, Missouri…….In loving memory of: Katherine “Kathy” A. Frazier, 72, who passed away, Dec. 25, 2017. Funeral service will be held at Seven Dolors (Hurlinggen) Catholic Church on Sat. Dec. 30 at 10 a.m., with Rev. Christian Malewski officiating. Christian burial will follow at Bethel Cemetery in rural Weatherby. Visitation will be held at Turner Family Funeral Home in Maysville on Fri. Dec. 29, from 6-8 p.m., with Rosary at 5:30. Kathy was born in St. Joseph, Mo. to Orville E. & Margaret Akey on Jan. 14, 1945. She grew up in Cameron, Mo., Graduating from high school there in 1963. Kathy worked as a Social Security Specialist with an accomplished career spanning some 30 + years. Her family loved to tease her,calling her “St. Katherine”, for she was well known as the most kind, caring & giving person. 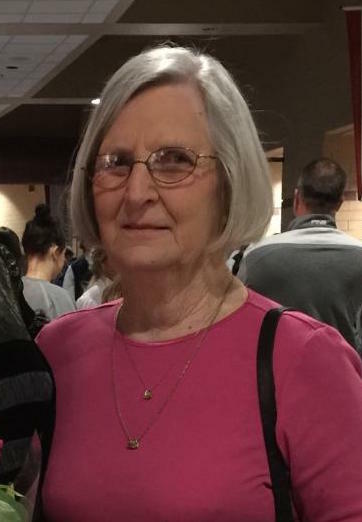 Kathy loved her church, serving as greeter, handling deposits, doing liturgical readings, leading the Rosary, providing for carry in dinners, & donating a lot of her time. She volunteered weekly, calling Bingo at Sunset Home & always made food for families in their hour of need. Kathy loved making jelly & quilting, (much of which was donated to raffle, or made for others.) Because of her servants heart, she was the recipient of many accolades, including the coveted & prestigious “Bishop’s Award”, from the St Joseph-Kansas City Catholic Arch Diocese. The amount of good she accomplished in this world, as a disciple of God, cannot be measured. Everybody liked her. She was the most unselfish, giving, & humble person. Always deferring the praise she would receive to others. Kathy was an awesome role model & a wonderful wife, mom, & grandmother. She gave her all to the very end of her life, & even after passing, due to her organ donations. Kathy was part of the St. Mary Quilting Group & The Linus Project, making afghans & quilts for many children & adults. Her & Mike had visited all 50 states in their many travels. I am so sorry for the loss of one of my best Cameron friends. My heart goes out to Mike, Ronda, Ronnie and family. She always found time to see me when I came back for visits. We loved sharing stories of our children, grandchildren and great granddaughters. She dearly loved her family, friends and church. She is a true friend that I will dearly miss! So very sorry for the loss of Kathy – she was always so friendly and such a wonderful person. Heaven gained an Angel. I knew Kathy when I taught her children at Clarksdale Elementary School in the early 1980s. She was always so friendly and she was proud of her children. She also had a great sense of humor about her kids, and especially Ronnie – who also had a great sense of humor! In all ways, she was a “pillar of the community.” Her sudden departure from her friends and family is no doubt a terrible loss, but she would not have wanted to depend on others with a lingering illness. My thoughts and prayers are with all of you as you share memories and stories. This was a woman who showed me so many things. Crocheting tips while we worked our 12 hour shifts at the Clarksdale polls on Election Day, her recipes for her jams. But most of all, she taught me how important it was to serve your community unconditionally. Nobody did it better! As I sit here and read her Christmas card, I see her note that said “let’s go to lunch soon”! I know she meant it! She will be missed! Thoughts and prayers to Ronnie and Rhonda, and families. Mike sorry for the loss of Kathy. I apologize for missing her service as I don’t subscribe to the news press. Barb and I have you and your family in our prayers. She was a wonderful person.